Company founder Ken Hughes has more than 35 years of professional experience helping people effectively maintain and improve their computer and telecommunications systems. Ken’s previous experience includes President of NAZTEQ, Systems Administrator at Math Solutions, Network Systems Engineer at Marin Computer Systems, and Telecommunications Coordinator for several prominent law firms in the San Francisco Bay Area. His specialties include setup and repair, purchasing analysis, and maximizing computer efficiency in a timely manner. Ken holds certifications from Apple and Northern Telecom and is proficient with both Macintosh and Windows. 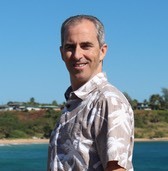 Mr. Hughes is a member of the Kauai and Kauai Filipino Chambers of Commerce, the Lihue and Kapaa Business Associations, and the Rotary Club of Hanalei Bay. Ken was previously a member of the Sedona Arizona Chamber of Commerce, an affiliate of the Sedona Verde Valley Association of Realtors, and vice president of the Sedona Referrals Club. He has served as chair of the Parks & Recreation Commission for the Town of Fairfax, California, and participated in multiple associated committees.